Happy February everyone! Wow, how is it already February? Amazing how time flies. I am excited to be back here with a little photo shoot I did to celebrate Valentine's Day. I have a total sweet tooth so my arm did NOT have to be twisted to take on this project! It was a great excuse to gather some delicious desserts and create a display with some fun party ideas. And, then we ate it... all. A variety of serving pieces and cake stands provides depth and height to the display. Not only am I a sucker for sweets but (if you follow me on Instagram, you know) I LOVE flowers! Hard to find a wedding planner who doesn't, I suppose. The flowers for this shoot were all fun and girly -- ranunculus, tulips and quince in various shades of none other than pink. Thanks to my floral collaborator on this shoot, Emily Sharp of Emily Ellison Studio. I also loved picking out the dessert varieties. Macaroons from Laduree were an absolute must because they are so cute and delicate. The MiniMelanie jeweled truffles painted in shades of pink and red added some bling to the bar. In fact, these are custom colors! 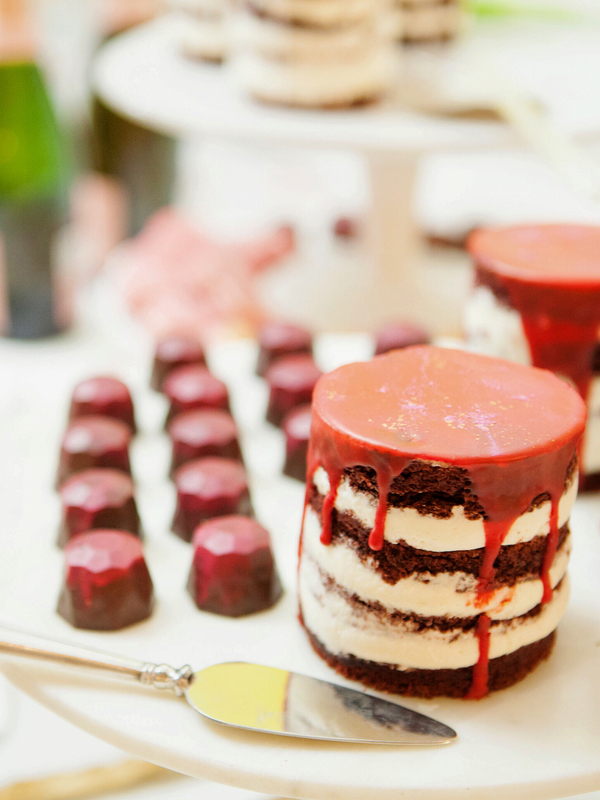 Plus those luscious pastries and the mouth-watering jewel box cakes - talk about decadent. My husband and little girls and others floating through the house that day devoured them. Everything on this table was over the top delicious! I think it bears repeating that you should always pick your desserts (or food in general) based on taste. Of course, you want your desserts to look fabulous, but what fun is that if they don't melt in your mouth?! Macaroons from Laduree, with MiniMelanie jeweled chocolate truffles. The displays for this shoot came from a variety of pieces I already owned including a couple of beautiful plates from Canvas Home. I like Canvas because everything is simple without looking too perfect. For a holiday like Valentine's Day that can feel so girly, I sought a balance between light and airy (and pink!) without being too frilly or overdone. A single ranunculus on the plate served as a simple and clean accent to the display. I would be ecstatic to drink Veuve Cliquot any day of the week but I guess that would be a bit indulgent. For this occasion I chose the Rose because of the beautiful color. Dropping a few raspberries in the glasses made it extra festive. Putting together a dessert bar is a fun and easy way to provide food for guests without hosting a full dinner party or luncheon. It also gives you more flexibility on the timing of the gathering as you are not tethered to a meal time. For past Valentine's Day celebrations, it was always going out for a romantic dinner or a party or sitting at home watching LOVE ACTUALLY with girlfriends. Now, I find its an opportunity to create something sweet and special for those you love. Make sure you're following me on Instagram for more seasonal party ideas and entertaining tips!